Within a few short years, fiber optics has skyrocketed from an interesting laboratory experiment to a billion-dollar industry. But with such meteoric growth and recent, exciting advances, even references published less than five years ago are already out of date. The Fiber Optics Illustrated Dictionary fills a gap in the literature by providing instructors, hobbyists, and top-level engineers with an accessible, current reference. 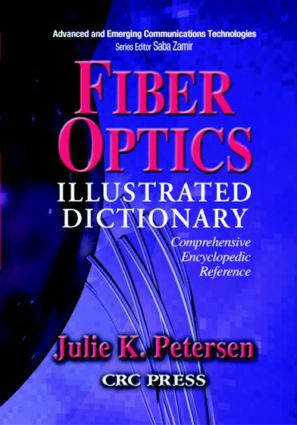 From the author of the best-selling Telecommunications Illustrated Dictionary, this comprehensive reference includes fundamental physics, basic technical information for fiber splicing, installation, maintenance, and repair, and follow-up information for communications and other professionals using fiber optic components. Well-balanced, well-researched, and extensively cross-referenced, it also includes hundreds of photographs, charts, and diagrams that clarify the more complex ideas and put simpler ideas into their applications context. Fiber optics is a vibrant field, not just in terms of its growth and increasing sophistication, but also in terms of the people, places, and details that make up this challenging and rewarding industry. In addition to furnishing an authoritative, up-to-date resource for relevant industry definitions, this dictionary introduces many exciting recent applications as well as hinting at emerging future technologies.